This is the same cute volleyball keychain design and shows it on two of the volleyball keychain styles. 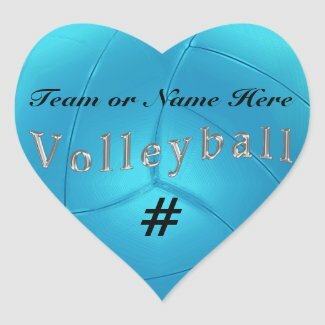 The first are the cheap volleyball keychains starting at Under $4.00 the next are the Premium Personalized Volleyball Keychains for around $20.00 depending on the size you choose. The cheap acrylic volleyball key chain has BULK discounts along with the volleyball stickers below. Wonderful senior night gifts for volleyball. She will love the popular satiny look purple with her name, or team name or give it to the coach. 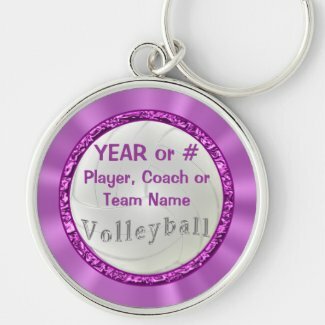 Personalize ONE volleyball key chain at a time, ADD to CART and then you can return to personalize the next key chain. Her Name and Jersey Number and you can even change the Background and Text COLOR by Clicking on the blue “Customize it” Button, then Click “Edit” Drop Down Box to the right of the product, Click the very last “Background” and Click on your favorite “Color Box” then Click “Done”. OR, Call or Text me and I can change the colors for you or make any changes to any of my designs or place on any product. 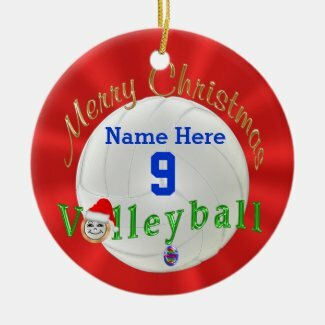 I created many cute volleyball bedroom decor gifts for Christmas or any day. 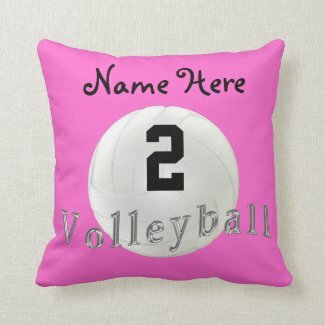 Many of them have changeable background or text colors as do the volleyball bedroom decor above. Girls will love seeing their name and number on these cute volleyball gifts for girls. You will be very impressed with the vibrantly printed quality products by Zazzle. All of the Zazzle merchandise that I bought is fantastic. I decided to become a designer for Zazzle after hearing their mission statement to provide their customers with superior service, quality products and the best on demand printing company. 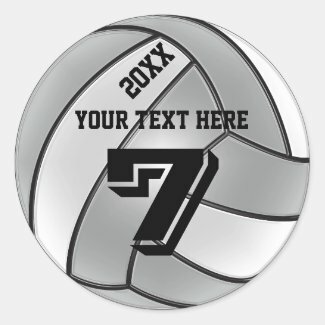 The volleyball stickers come in a variety of sizes and shapes. The price varies greatly depending on how many stickers per sheet. Some have 20 volleyball stickers per sheet for the small sizes and the larger sizes have around 6 per sheet but that might vary. Just type her Jersey Number or her Monogram, the Team Name or her Name. Great Volleyball Senior Night Favors and gifts. 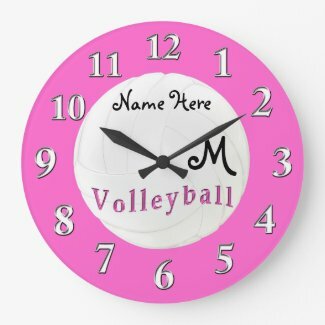 Thank you for coming to our Personalized Volleyball Gifts for Girls article with just a few of the many Personalized volleyball gifts we offer. Original designs she will love. You will be giving a very special memory that she will love and appreciate forever. Girls our passionate about their favorite sport. Remember, I can make any changes for you at no extra cost. I love helping you create a special memory for the volleyball players.